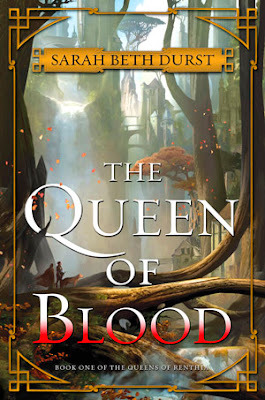 Synopsis: The Queen of Blood, which comes out TOMORROW, is a foray into YA crossover fantasy by Sarah Beth Durst, author of numerous wonderful, whimsical, fantastical MG and YA fantasy titles such as (most recently) The Girl Who Could Not Dream (reviewed here). The author has such a facility for writing for all ages—her adult title The Lost (reviewed here) received acclaim as well—so I was not surprised at all that I enjoyed this one so much. The Queen of Blood is Book 1 of the Queens of Renthia—Renthia being the world where the story takes place. In the nation of Aratay, as in the other lands in Renthia, there is an uneasy balance between the human denizens and the spirit world: spirits of earth, fire, ice, air, and water inhabit the natural world, and only the female humans might be born with the power to control and command spirits. The Queen of Aratay is the one who maintains this balance: selected from those with the innate ability and trained for years in the right skills to keep the human-hating spirits at bay. Daleina grew up in the small village of Greytree on the forested fringes of Aratay, far from Queen and capital, training under the village headwitch to perhaps grow up and take her place. One fateful day, when Daleina is still a child, her village is attacked by spirits: something that isn't supposed to happen with the Queen in charge. But it sets events in motion, and Daleina finds herself a few years later just barely squeaking into the magical Academy at the capital, getting trained to use her rudimentary powers. Could someone as low in power as Daleina truly be in the running to be Queen? She doesn't know, but she's determined to learn as much as she can along the way…and help Aratay hold back the increasingly frequent spirit attacks. Of course, in a world that is increasingly subject to supposedly impossible incursions by malevolent spirits, one must expect the unexpected…and that pertains to Daleina's story, too. Observations: There is an element of the magical school story in this one, like Harry Potter or (even more so) Princess Academy, and that is definitely a positive in my eyes. And like many school stories that revolve around the new kid, the smallest kid, etc., the protagonist goes from someone who is out of her element and seemingly lacks the same skill set as those around her, to realizing her own special and unique abilities and coming into her own power. In fact, I think this is one of the areas where this book truly shines: Daleina is relatable because she is so very much someone who does not feel special at all, and yet she is. In compensating for the abilities she herself lacks, she is able to uniquely see and tap into the talents of those around her, and has the humility and pragmatism to actually do so. And this just might be the one skill that truly saves her life, and her world, as she grows into adulthood and is challenged in every way, physically, mentally, and magically. Conclusion: I stayed away from specifics because this book was full of so many wonderful surprising elements in terms of world-building and the way the magic works, but here is one more teaser in case you need more reason to pick this one up: in Aratay, a forest world, everyone lives IN THE TREES, in magically grown houses that are an organic part of branches and tree trunks, getting around via bridges and zip lines from tree to tree and village to village, like Ewoks. If that isn't awesome enough for you, I don't know what is. I received my copy of this book courtesy of the author/publisher via NetGalley. You can find THE QUEEN OF BLOOD by Sarah Beth Durst at an online e-tailer, or at a real life, independent bookstore near you TOMORROW! Pssst! It's out this week!! !